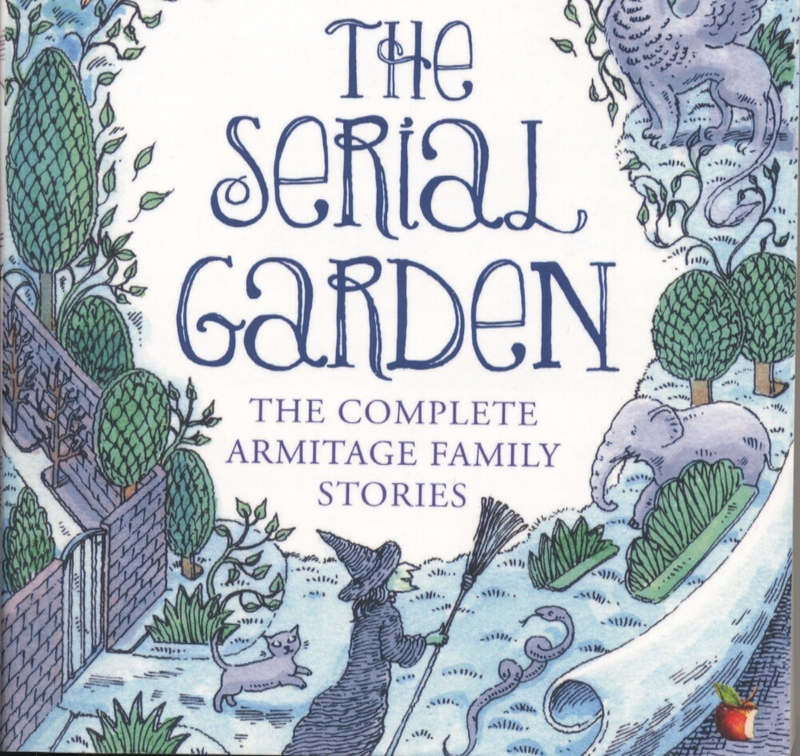 This was clearly a memory from Joan Aiken’s own childhood, and she turned it into one of the most haunting stories she ever wrote – ‘The Serial Garden’. In this memorable story, one of the many she wrote about her imaginary Armitage Family, Mark discovers that a cut out garden from the back of a series of cereal packets comes to life when he whistles or sings a certain tune. 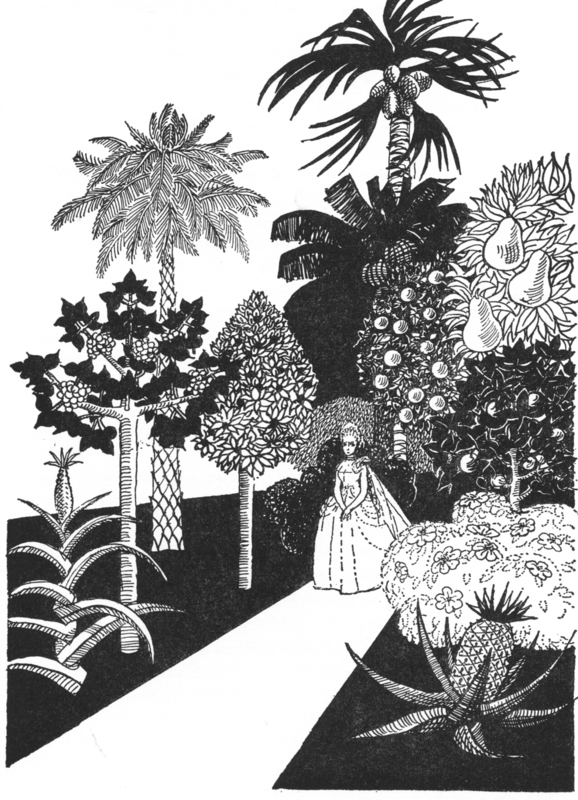 He then learns that the garden comes from an old book of pictures belonging to the Princesss of Saxe Hoffen-Poffen und Hamster, and that she herself is imprisoned in the garden – thanks to a bit of parlour magic – still waiting to be rescued by her long lost love, the Court Kapellmeister and music teacher who her father forbade her to marry. – which was just what she used it for, concealing herself in the book, so that she could run away with her suitor. But the maid who was supposed to give the book to her beloved Kapellmeister never delivered it. Only when the pictures were reproduced on the back of a Brekkfast Brikks packet many years later, could the garden be re-created, and the tune which had unwittingly been passed on to Mark by his own music teacher is the very one to bring it to life – is there finally a chance of happiness for the long estranged lovers? But while Mark is out, urgently fetching his music teacher, Mr Johansen, his mother, Mrs Armitage has been spring cleaning…. The character of Mrs Armitage was based on Joan’s own mother, Jessie Armstrong, married after her divorce from poet Conrad Aiken, to Joan’s second writer father, Martin Armstrong. When Joan was young Armstrong was famous for his own children’s stories about a rather suburban 1940’s family in thrall to their various talking pets, but her own Armitage stories which began as a tongue in cheek parody of his, became a lifelong passion. This particular story, originally published in Jessie’s lifetime, in a collection of fantasy stories called A Small Pinch of Weather was even dedicated to her mother, but in later years Joan came to be haunted by the sad ending of the story; perhaps she felt it was unjust to her mother’s memory, she certainly received many letters from readers protesting against its rather shocking ending. Joan wanted a chance to make amends, and although she couldn’t undo the dreadful ending of the first story, she could perhaps give Mark and poor Mr Johansen another chance to find the vanished garden and the lost princess. Just before she died Joan was preparing a collection of all the Armitage Family stories she had written over the years, including four new ones and a sequel to ‘The Serial Garden’ story, giving the chance of a hopeful solution to the estranged lovers. She planned that the book would be published under the title of The Serial Garden to alert anyone still waiting for their long promised happy ending, that it might finally be on the way. So if you missed it, and are one of the people still haunted by that unforgivable ending, all is not entirely lost – the book has come out and perhaps hope can spring again…and you can enjoy the entire collection of these witty and wonderful stories! This entry was tagged Armitage Family stories, Classic Children's Books, Joan Aiken new story collection, The Serial Garden, Virago Children's Classics. Bookmark the permalink. Huzzah! Must reread and review this marvellous sequence. Love the new cover too! I shall try and spread the word. Any Joan Aiken story collection is always cause for celebration. Hooray that this one is finally getting its due in the UK. Yes, hooray for Virago – and they are bringing out a second collection next year. So good to keep them available – Joan often said her fantasy stories were among her best work! They’re certainly among my favorites, and I’ll be hoping for a nice fat selection. Yes! Huge relief all round…! It’s called The Looking Glass Tree, and just adds more confusion really, but of a hopeful kind.